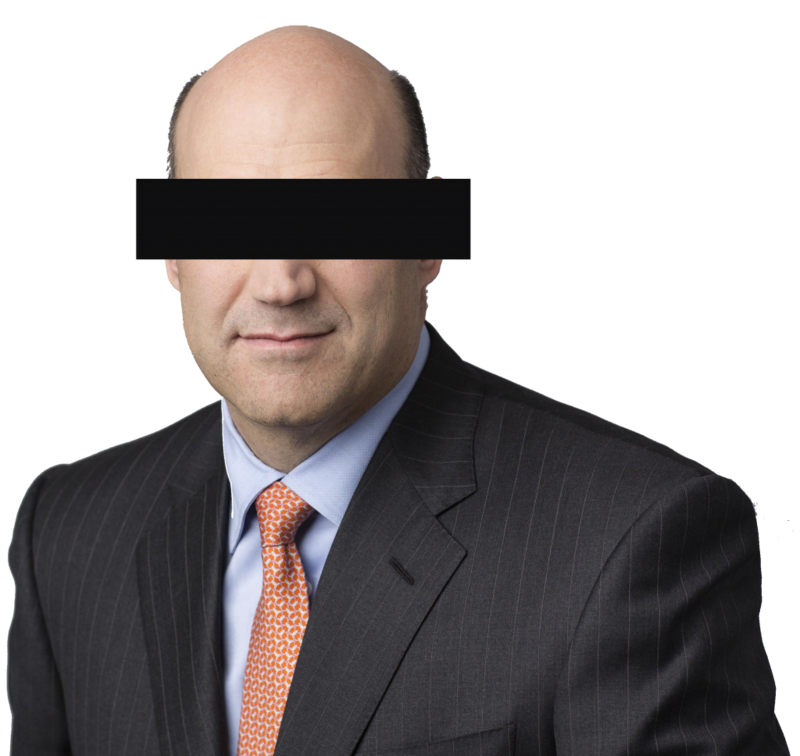 Why Won’t Hedge Funders Confess Their Role in Multi-Million-Dollar Lobbying Campaign? 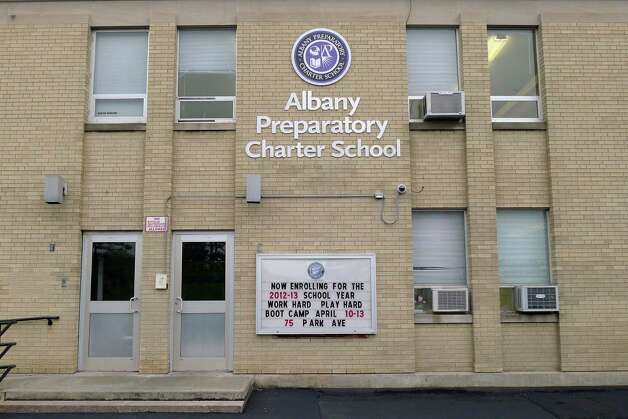 More than $13 million has been spent since 2014 by two charter/privatization groups trying to eliminate New York’s cap on charter schools and win backing for an unprecedented tax credit that would divert huge amounts of public resources into private schools. 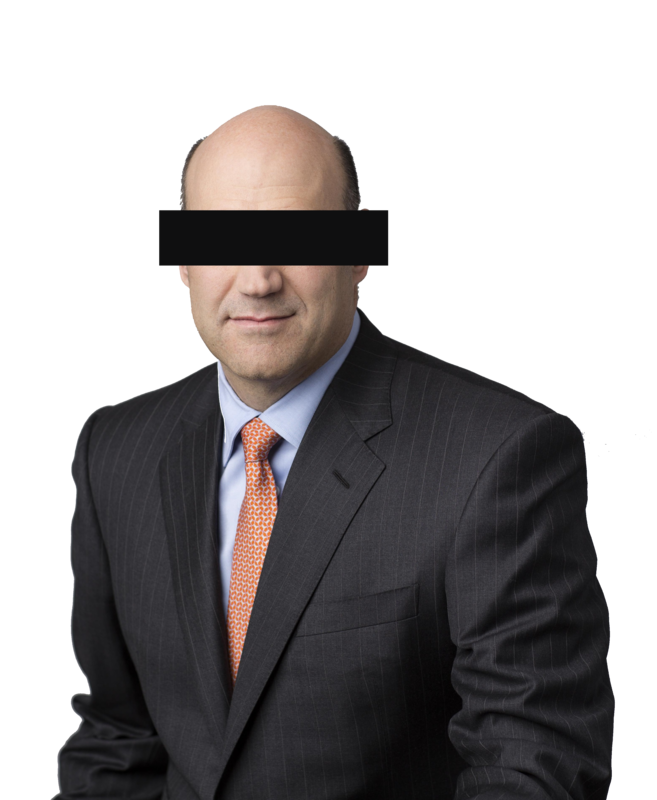 One of the big spenders – Families for Excellent Schools – uses a loophole to hide the names of its wealthy funders.  Hedge Clippers research has discovered that the largest single donor to the recent FES campaign was in for a cool $3,000,000, while six more major donors gave $1 million -$1.5 million each. But FES uses a loophole in nonprofit and lobbying law to hide the names of its donors (as outlined below). The big question — who are “Mystery Seven” big-money FES funders and what do they hope to get out of pouring money into supporting Governor Cuomo’s deeply unpopular education agenda? Are they Dan Loeb, Paul Tudor Jones and other contributors to “New Yorkers for a Balanced Albany” who spent millions last year to ensure a Republican-led State Senate? State disclosures show that the newly created “Coalition for Opportunity in Education” – the biggest lobbyist for Cuomo’s proposed education tax credit– is funded overwhelmingly by wealthy conservatives. Of the eleven recently revealed donors to the newly created “Coalition for Opportunity in Education” four are billionaires – and all are current and former hedge fund managers. The two privatization policy proposals that are still on the table are the New York State Education Investment Tax Credit and an increase to New York’s charter school cap. Both proposals are favored by the same small handful of wealthy hedge fund managers, many of whom also contributed to “New Yorkers for a Balanced Albany,” the hedge fund-backed political action committee that helped flip control of New York’s State Senate to now-indicted Dean Skelos and his Republican conference. The front groups supporting these two education-privatization proposals have spent $13,074,217 on lobbying and media buys alone since 2014. 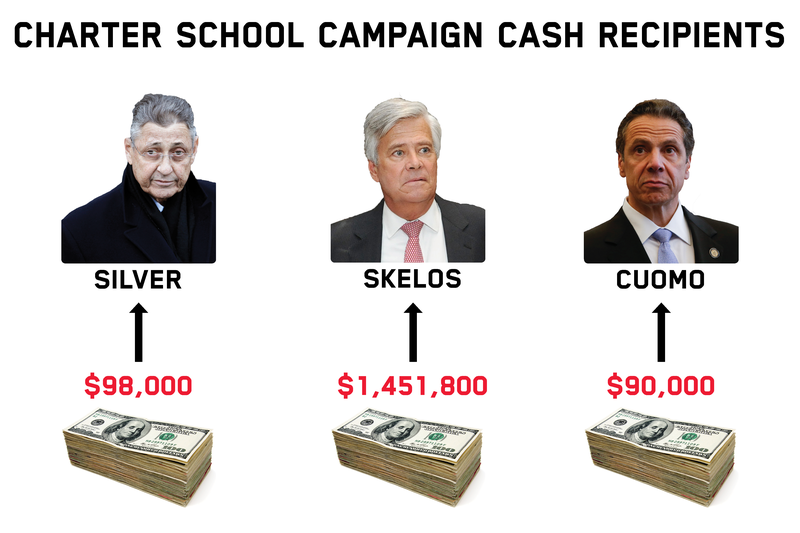 This number was compiled using lobbying and FCC records, and likely significantly under-reports the amount of television ad buys that the groups have purchased to support of Cuomo’s deeply unpopular education agenda. *this number was compiled using lobbying, FEC records, and information from sources with direct knowledge of the latest ad spending. These millions for lobbying and advertising are on top of their unprecedented $4.25 million effort to flip the New York State Senate in last November’s election. Why spend so much money? Because these policy proposals are deeply regressive attempts to privatize large swaths of New York’s public school system – and it just so happens that Cuomo’s proposals could end up handing wealthy New Yorkers millions of dollars in new tax deductions, tax credits and special subsidies. New York State currently has one of the most deliberate and reasonable charter school approval programs in the country. Cuomo and his hedge-fund allies want to explode the system and allow unchecked growth of privatized charters all across the state. Under current law, when charter school operators want to start up new schools in the state, they have to submit a proposal to one of four charter authorizers. If the charter school proposal isn’t up to snuff, the charter gets rejected. And New York has a cap on the number of charter schools, to prevent unchecked charter growth from financially crippling public schools and harming non-charter students. Use their deep pockets and exploit dark-money secrecy to unleash large-scale lobbying for radical policies that lack of public support. Push through policies that hurt public institutions but allow big private profits. 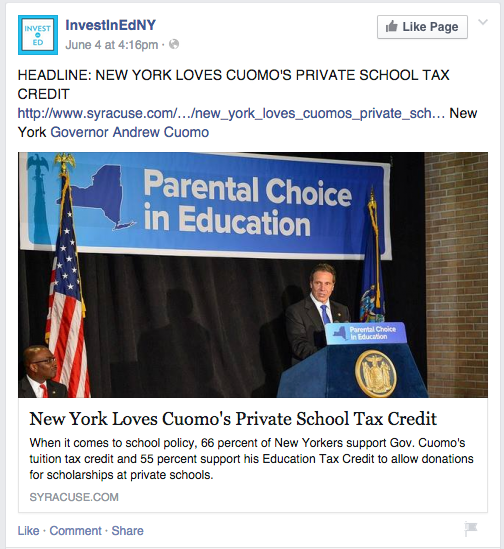 The hedge fund billionaires behind Cuomo’s charter-cap scheme are using this method to lobby the legislature, mislead the public, and set themselves up for big profits from bonds and tax credits related to charter school expansion. 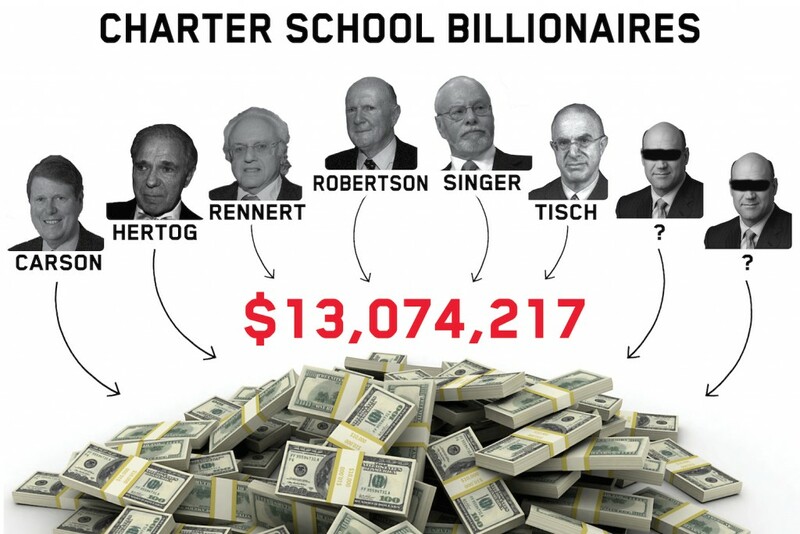 Billionaires who support unchecked charter school growth have found a loophole that allows them to evade New York’s source of funding disclosures. Families for Excellent Schools, the dark money front group favored by hedge fund billionaires, is exploiting a loophole in New York’s source-of-funding disclosure law. The law, designed to force disclosure of the funders of dark money groups lobbying in New York, was enacted in reaction to the overreach of Citizens United. Unfortunately, the law never envisioned that the top lobbyist in the state would be a 501(c)3 charity, and not a 501(c)4 issue advocacy organization. Charities can lose their tax-exempt status under federal law if a substantial part of their activities are lobbying-related. And, unfortunately, the federal government defines lobbying differently than New York State, which requires certain types of advocacy to be reported. Families for Excellent Schools, which has hired the former director of the Temporary Commission on Lobbying to advise them on lobbying compliance— is exploiting this loophole to hide the names of their wealthy funders. So, despite being the biggest lobbyist in the state in 2014, the billionaires who set Families for Excellent School’s lobbying agenda are totally unknown. We do know, however, that these are big-money players. . Hedge Clippers has obtained a redacted copy of the 2013 donor list for Families for Excellent Schools, which shows donor amounts but not names. A review of the donor amounts shows that Families for Excellent Schools received just 28 donations in 2013, with seven donations of more than one million dollars. Nearly a quarter of the $12 million in revenue raised by Families for Excellent Schools in 2013 comes from one individual, who donated $3 million. Growth in charter schools is a significant credit risk for urban school districts, according to the ratings agency Moody’s. According to Moody’s, charter growth can cripple the credit ratings of urban school districts, leading to increased borrowing costs and declining public school enrollments. This stress, largely due to district’s inability to reduce operation costs in response to declining enrollment, can touch off a “death spiral” where district costs increase, leading to an increase in charter enrollments. Moody’s has documented this pattern in multiple urban districts: Philadelphia, PA, York, PA, Cleveland, OH, and New Orleans, LA. 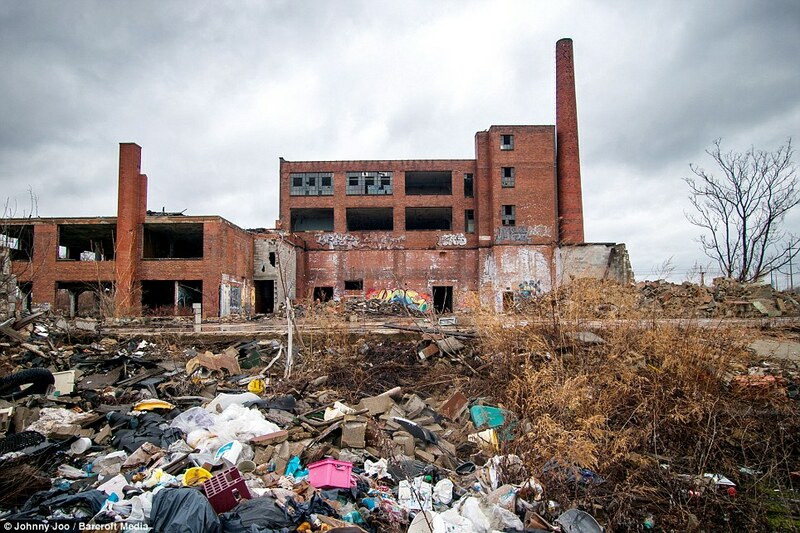 York, a small Pennsylvania city roughly the size as Binghamton, NY has been particularly devastated by an unchecked growth in charter schools. After growth in charter school expenses outstripped state aid by a ration of 3:1 from 2009 to 2013, York’s remaining public schools were in shambles. In 2013, the City adopted a controversial plan to turn over the entirety of the remaining traditional public schools to for-profit charter school operators. Prior to the charter takeover of York, Moody’s cited the city’s school district as having suffered from unchecked charter school growth. While urban school districts stand to be crippled by increased charter school growth– especially in upstate cities already struggling against economic headwinds– Cuomo’s hedge fund buddies stand to earn millions from their destruction. Charter school property acquisitions are frequently financed with high-yield bonds, and there is significant interest from investors in the yields provided by these risky bond deals. AllianceBernstein, an asset management firm, recently sent several representatives to a New York Harvard Club meeting of charter school bond investors. Roger Hertog, the founder of Alliance Capital, now merged with AllianceBernstein, donated $100,000 to New Yorkers for a Balanced Albany, which helped flip the New York senate to support charter legislation. Other asset managers who registered for the charter school bond investor conference included: Buck Financial Advisors LLC, BlackRock, RBC Capital Markets, Alvarez & Marscal, Jeffries LLC, Nuveen Investments, Palmer Square Capital Management, Samson Capital, Prudential Investments, Commerce Street Capital, and Pioneer Investments. The education tax credit bill favored by Governor Cuomo and his wealthy allies could create a situation where New York State is cutting $1 million checks to billionaires for donations to private schools that they are already routinely making. 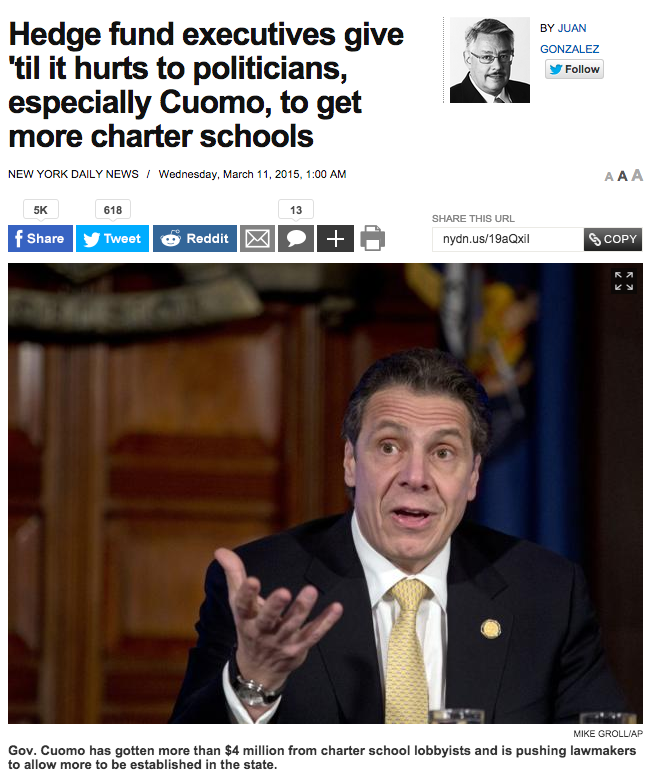 And of course, Cuomo’s plan could give subsidies of up to $1 million wealthy New Yorkers for money that they’re already donating to their children’s elite private schools.—and would benefit many of the same billionaires funding COE. Of the eleven recently revealed donors to the “Coalition for Opportunity in Education” four– current and former hedge fund managers all– are billionaires. Another recently disclosed donor to the Coalition for Opportunity in Education is The American Federation for Children, a conservative voucher organization run by Betsy DeVos, one of the largest donors to the Republican Party. DeVos has previously run afoul of campaign finance laws with her prior advocacy vehicle, “All Children Matter PAC.” In 2008, the state of Michigan fined All Children Matter $5.2 million, a state record. Instead of paying the fine, DeVos simply created new organizations to continue her political advocacy. As we have written about previously, wealthy New Yorkers like the tax credit program because it gives them a hefty rebate for donations that they’re already making. Socially conservative hardliners like Betsy DeVos love the tax credit program because it subsidizes schools that teach conservative positions on evolution, race, and sexual orientation. 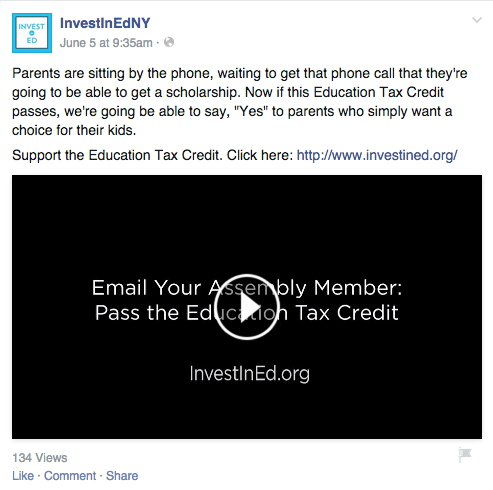 We aren’t quite sure why Governor Cuomo has come around to the tax credit bill, but we have a few ideas. D’arcy, Michael. ‘Charter Schools Pose Growing Risks for Urban Public School Districts’ Moody’s Investor Service.